Good morning or afternoon or evening everyone! Sorry for the radio silence. :/ I just hadn't been feeling like writing a blog post. So I decided than force myself to do it and A) hate doing it and B) put out crappy content I just wouldn't do one. I'd give myself a little break to let me relax and think. But I'm feeling ready to get back at it! 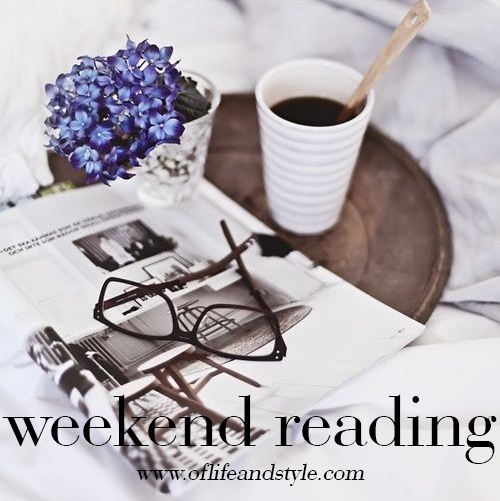 So here's our Weekend Reading! 14 things I wish I knew in my 20s. A great article if you're like me and in your 20s! Catchphrase with Jimmy Fallon, Marlon Wayans, Jason Derulo and Amanda Seyfried. I couldn't stop laughing! Where to stay in Paris. I can't believe Jessica stayed in this place! It's amazing! Loving this striped top, white jeans outfit combo. You guys know how much I love both. Skinny cake batter ice cream. HELL YES. 25 signs you work in social media. Now that I've started my internship working in social media I can definitely relate to some of these! 11 thoughts you have when someone brings donuts to work. Scarily accurate. And we're continuing with the wanderlust (seriously I need a vacation. Anyone wanna go? with the 10 best travel sites. An editor tried living her life like a fashion blogger/Instagrammer and this is how it turned out. It's wedding season and here are a few unconventional wedding ideas/advice. I love emojis, I think most everyone does. Here are the top 100 emojis. Interesting to see which are the most popular from a poll. Also I didn't know you could order pizza from Domino's by just typing the pizza emoji?! Going to New York? Then check out these coffee shops for your morning cup of Joe! Must do's in Positano, Italy! Love this striped midi dress outfit! I need this skirt stat! The ultimate LA guide to donuts. Next time I go to LA I'm hitting some of these up! #TheInternDiaries: Resume Tips // Started a new series about being an intern. Cobalt and Converse // Styled this adorable cobalt romper. Hope you liked this weeks links! What have you been loving on the Internet? Leave me a comment sharing! Oh great articles! will be reading these soon! thanks you for such a cute information, great blog!